The minute you sign up on Upwork and have your profile approved by the support team it is important to set up payment methods. To set up payment methods on Upwork is easy. Follow me as walk you through a step by step picture walk through of how to get into the settings page and set up payments. Please note that for you to set up payment methods on upwork you need to already have active accounts on Paypal, Skrill, Payoneer or a Local Bank. Step 1: Click on the Dropdown next to your name. You may or may not be prompted to re-enter your password in order to enter the settings page. Click on the Get Paid Tab on the settings page and a new window will load where you will be possible to Add a new Payment Method. Once you are ready click on Add a new Payment Method. Once the Add a Payment Method loads select the payment method that you want to add. From the options available it is possible to add a Local Funds Transfer, Skrill, Paypal, Direct Bank and Payoneer. Feel free to set up a method that is favorable for you. I hope this step by step walk through helps anyone interested with setting up a new payment method on upwork. Feel free to drop your comments in the comments section below. hello David, I appreciate your effort for writing this informative article. Kindly write about how to fill upwork W-8BEN tax certificate. Thanks for taking time to read this article. Highly appreciated. The w-8BEN for is easy to follow and just needs you to read and reply as it is written. It doesn’t take more than 3 minutes to complete it therefore no need of an article for that. Kindly elaborate. Do you have an Upwork account? Thanks for the article. How do I add an Mpesa number to my payment method? because the option of Mpesa dosent show on the upwork menu. 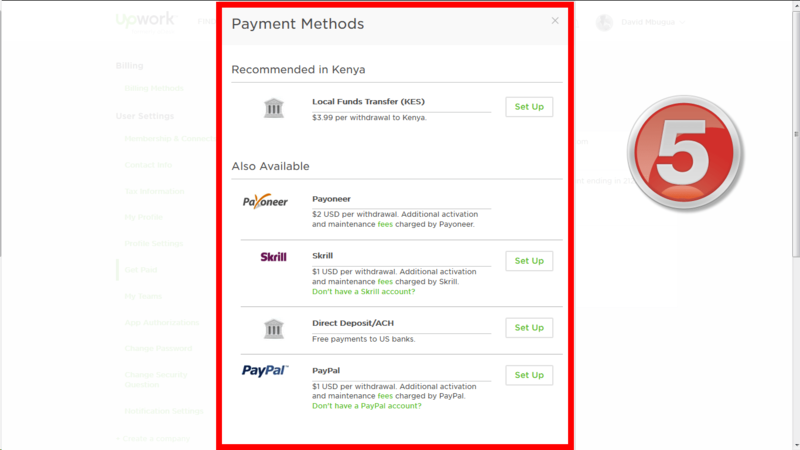 Mpesa is a new addition to the list of the payment options but seems a bit tricky to set up. Have you tried it? I have and every time I get the (please add the correct number message) even after trying all the different formats of my number that I can think of-. Tried to contact Upwork but they didn’t provide any useful information. Any advise on this would be greatly appreciated.